When you go to the Mokotow family tree, the "Search for Names" screen as illustrated on the left is the first to appear. Find a person in the family tree by providing sufficient information for the search engine to identify the person. The search engine will locate all persons that meet the criteria specified. Do not fill in all the fields; instead only fill in the minimum necessary to identify the person being sought. For example, if you key in only the Last Name and then click the "Search" button located at the bottom of the screen, the system will display all persons with that last name. If the name is common, consider including the First Name before clicking the "Search" button. 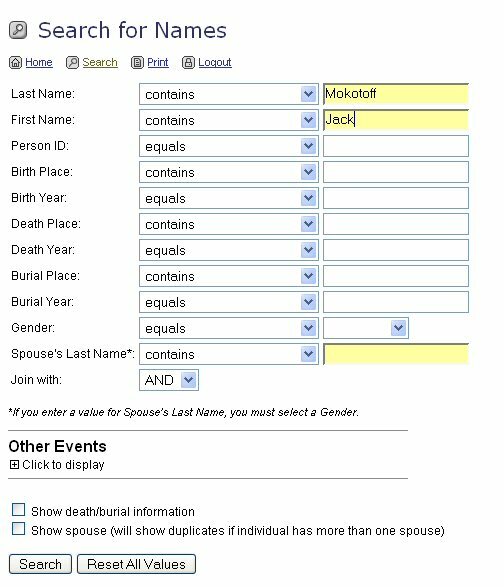 For example, the search requested to the left is for any person whose Last Name contains "Mokotoff" and whose First Name contains "Jack." If you have difficulty locating a person, it is probably because of an alternate spelling of the person's name. There are a variety of ways to locate an individual on the tree. One possibility is to include in the search only the birth year leaving the name fields blank. This will locate all persons, independent of name, who were born that year. Name rules: Women are represented in the family tree by their birth name or name just prior to marriage. Men are are represented by their current name, if living, or name at time of death.